“Romantic” isn’t typically a descriptor one would use to describe a Guillermo del Toro film. 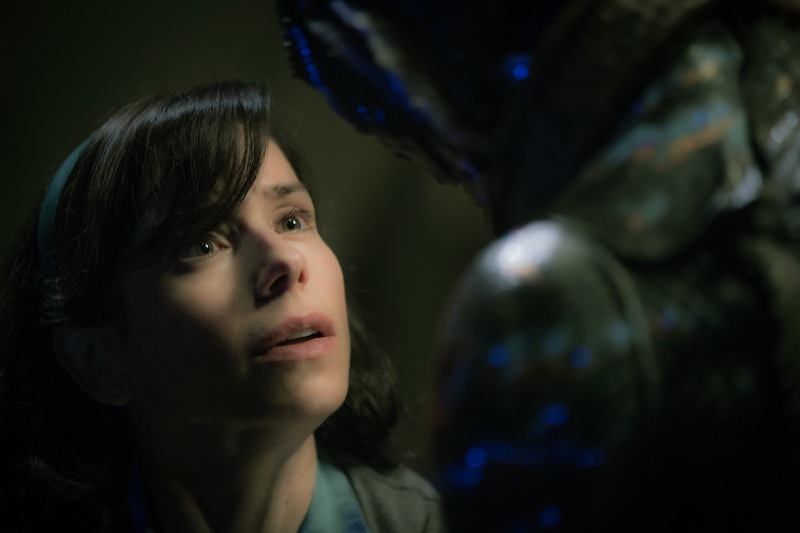 “The Shape of Water,” however, is decidedly del Toro’s most daring film, too, with unquestionable echoes of “King Kong” and “The Creature from the Black Lagoon” if the beauty and the beast actually fell in love and actually consummated their bond. Not unlike the fantastical filmmaker’s 2006 adult fairy tale “Pan’s Labyrinth,” del Toro brings a fairy tale sensibility to this otherwise real world, while adeptly juggling romance, suspense, horror and comedy in ways that should not work but always do. A tale of love, loneliness and connection at its core with the backdrop of Cold War paranoia where anyone who fell into a subset of “other”—mute, gay, black, Russian—was a suspect, the film is also a dreamy, rapturous love letter to classic monster movies and movies of all kinds. 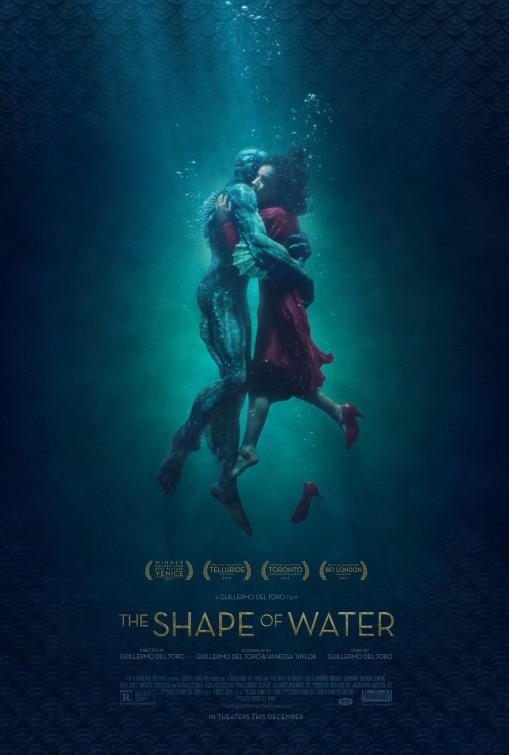 Successful on multiple levels, “The Shape of Water” is whimsical, enchanting, beautifully tender and unexpectedly moving. Baltimore, 1962. The mute Elisa Esposito (Sally Hawkins) happily lives her life by a routine in her apartment above a movie palace. She lives next door to best friend Giles (Richard Jenkins), a gay, struggling freelance illustrator who’s as lonely as Elisa. Waking up to her alarm clock each night, she gets up, draws herself a bath and pleasures himself in the tub while her hard-boiled eggs cook on the stove. Elisa is then off to work the graveyard shift as a custodian in an underground government facility. One night, a “sensitive asset” is brought into the lab where scientist Dr. Robert Hoffstetler (Michael Stuhlbarg) is in charge and menacing security chief Richard Strickland (Michael Shannon) wields a cattle prod for protection. Elisa and chatty, outspoken co-worker and friend Zelda (Octavia Spencer) are instructed to just clean, but Elisa realizes the “asset” is an amphibious creature (played by Doug Jones) from South America. As Elisa begins sneaking into the lab to visit the merman, she brings extra hard-boiled eggs to feed him and finds that it likes to listen to jazz music playing from her portable turntable. Though Strickland sees the creature as nothing more than a weapon to beat the Soviets, Elisa sees humanity in the creature and realizes she hasn’t much time to save her unlikely love. 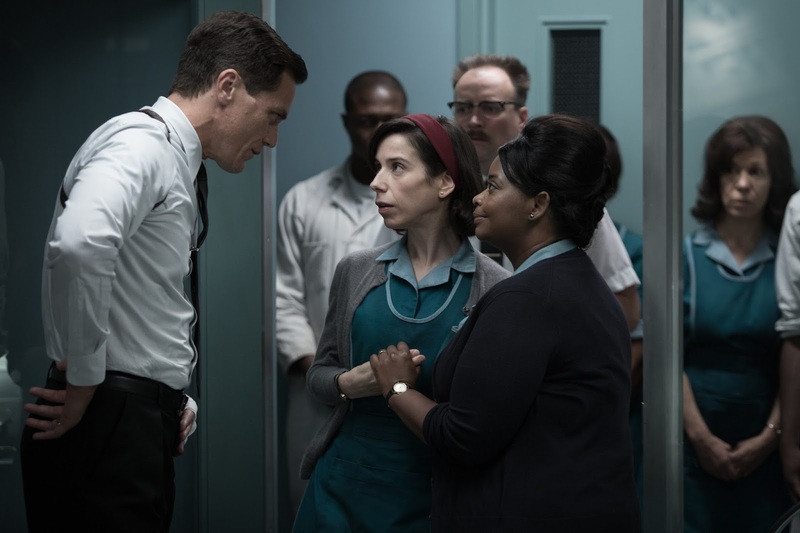 “The Shape of Water” is co-written by Guillermo del Toro (2015’s “Crimson Peak”) and Vanessa Taylor (2014’s “Divergent”), and as familiar as it may seem, they take a lot of risks in how far they take their story, no matter how strange some audiences might find the relationship between a human woman and a fish man. Like a lot of stories involving a monster, there is a character who wants to study it and learn more about it (Dr. Hoffstetler), a character who just wants to control and torture it (Strickland), and finally a character who isn't afraid but connects to it in ways others could not understand (Elisa). As much as “The Shape of Water” is a star-crossed love story, it is a horror film, indeed—Strickland loses two of his fingers early on and the creature doesn’t react too well around one of Giles’ cats—and a race-the-clock escape thriller as Elisa and her friend conspire to break the creature free. 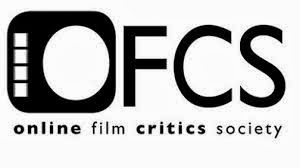 Throughout, the film is very much about one’s love for cinema, too, as Elisa and Giles sit and watch B&W movie musicals and tap-dance along with Shirley Temple, Betty Grable and Alice Faye, all while movies play below them. 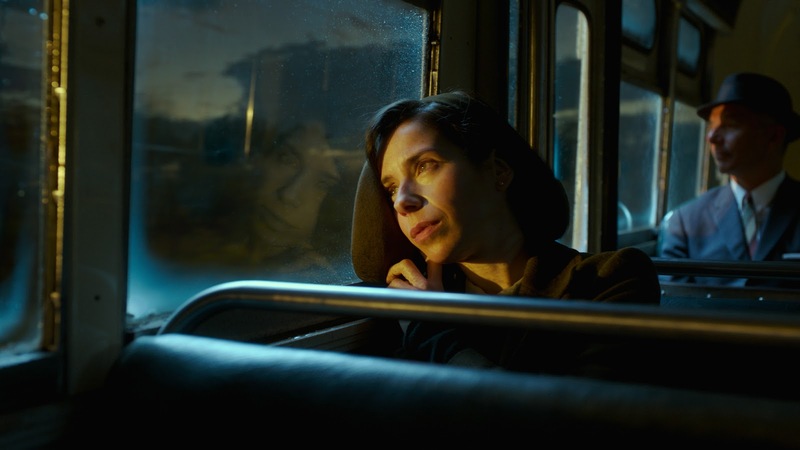 Sally Hawkins is sublime, soul-stirring and just plain lovely as Elisa, “the princess without voice.” Save for one black-and-white dream sequence where she sings, she is wordless yet still expressive, communicating everything one needs with her eyes and infectious smile to see when her heart aches and what brings her joy. The excellent supporting ensemble rounds out a band of marginalized outsiders living on the fringes of society, each of them finding depth in their well-rounded characters. 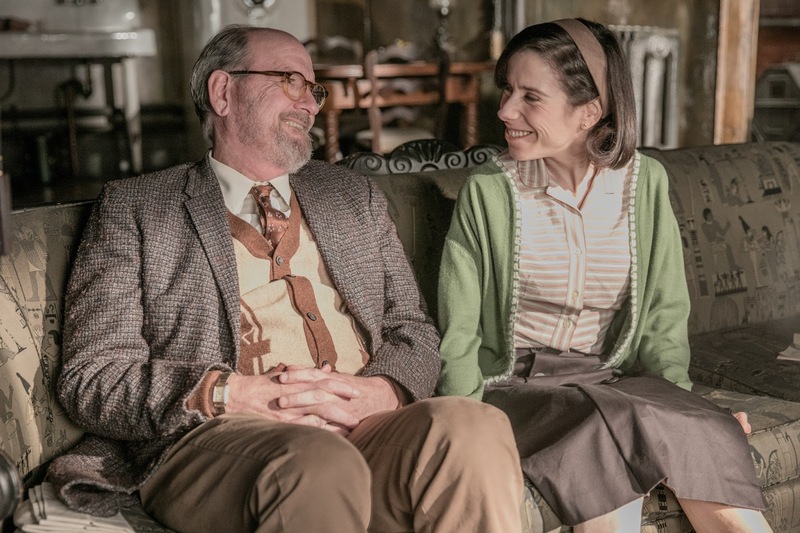 As Elisa’s loyal confidante Giles, Richard Jenkins is adorably funny and touching as he yearns for his cafe-owning crush to reciprocate his feelings, and his scenes with Elisa are an utter delight. Octavia Spencer is a hoot, too, bringing loyalty and speaking enough for both her and her friend as Zelda. Michael Stuhlbarg is also nuanced as Dr. Robert Hoffstetler, who has a secret of his own. Only does Michael Shannon seem to play the part of the racist, sexist, violent, altogether evil Richard Strickland in his sleep by now, but he is never less fearsome and intimidating as a human monster whose life at home is out of kitschy Americana. It should not go without saying that Doug Jones (who has worked with del Toro six times, twice as the amphibious Abe Sapien in the “Hellboy” movies) deserves special praise as The Creature, bringing a great physicality, ferocity and misunderstood sensitivity behind the meticulously designed suit. Guillermo del Toro makes everything about “The Shape of Water” look effortless. With a price tag of under $20 million, del Toro miraculously executes so many fantastical elements, from the underwater opening to the mostly practical effects of the creature. Technical specs are top-notch across the board, particularly the lush visual and aural splendor of cinematographer Dan Laustsen’s vibrant, emerald-hued color palette (when Strickland buys a teal Cadillac, the car salesman tells him it’s “the color of the future”) and the alternately swoon-worthy and haunting Parisian-inspired score by Alexandre Desplat. None of this would matter, however, if the story wasn’t instilled with such an emotional resonance and wistful melancholy, and it has both. 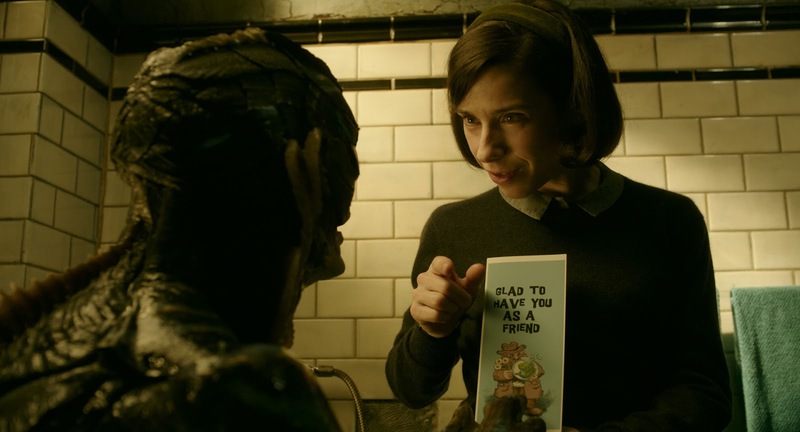 Unusual and wonderful, “The Shape of Water” is sheer magic.